Tell this guy that learning ain’t fun. As a motorcycle skills and safety professional, I am often frustrated and even saddened by the seemingly complacent attitude toward real skill development. It pains me to see riders who ignore the importance and benefit of learning to ride their motorcycle with more skill. Not only do sharp, well-developed skills make motorcycle riding safer, it also makes riding more engaging and way more fun. I get that motorcyclists don’t ride to be safe. We ride to have fun, which means that focusing on “learning” can risk turning an enjoyable pastime into something that starts to feel like work. I’ve seen many, many motorcycle riders run away when I mention “Training” or the dreaded “S” word…Dare I say it…SAFETY. “I just want to enjoy the wind in my face and the feeling of freedom, dude. Besides, I ride just fine.” Maybe, but could it be that riding can be MORE FUN if you learn how to ride better? Hmmmm? Skill development benefits all types of riders. The repulsion toward safety and skills development is one reason why it’s nearly impossible to get experienced riders to attend an advanced riding course. The other reason is that most riders don’t see the value in developing their skill. And it’s certainly not as fun as simply going for a ride. Why “waste” a Saturday or Sunday riding around a parking lot when there are open roads to explore…and for some people, bars to hop. Did I say that out loud? I was at a motorcycle expo earlier this year, helping to man a booth for the Massachusetts Rider Education Program (MREP). They had a riding simulator set up for people to try their hand at dealing with challenging riding situations. Jeannine on the Smart Trainer simulator. One guy (and I’m sure he wasn’t the only one) exclaimed proudly that he didn’t need to use the simulator because he’d been riding for 30 years. OK, said my colleague, show us what you know. The look on his face showed sudden anxiety. He kinda laughed as though we couldn’t be serious and then walked away. He was clearly afraid that he might be exposed as a mediocre rider. This happens all the time. New track day riders are afraid that they won’t be as fast as they think they are (they’re not), and this scares them. Egos are sensitive, I get it. But, if they can man up (sorry ladies) and take the plunge, they soon discover that it doesn’t matter how fast they are, rather it’s how skilled they are at controlling their bike that counts. You probably aren’t as good at riding a motorcycle as you think you are. “So what”, you say? Well, the last time I looked, riding a motorcycle is dangerous, even deadly. If that’s not enough to motivate you to spend a bit of cash and an afternoon brushing up on your skills, then maybe the fact that better skills means more fun will motivate you. The vast majority of people I’ve trained over the last 20 years experience MORE ENJOYMENT after a training session. That’s because they are now more confident in their ability to manage their bike, corners and traffic. Seriously. It’s worth the effort. Track Days are fun and increase cornering and braking confidence. I can’t say that the MSF courses offered around the country are exactly fun. You ride around a parking lot at 25mph as you go through specific drills that are designed to efficiently deliver vital information. Although there is a lot of laughing when groups of friends attend these parking lot courses, it’s usually all business. When it comes to combining “fun” and “training” together, there are two venues to consider. A track day and on-street training tours. 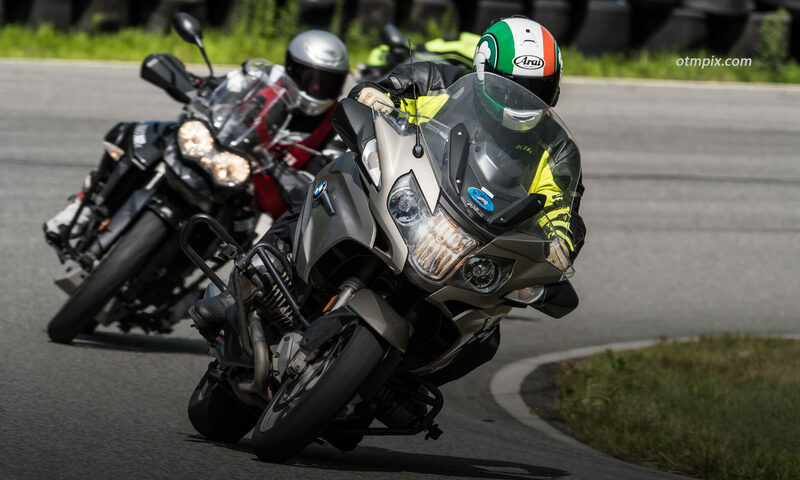 Sport bike riders are the likely people to take advantage of track day training, but some organizations cater to all types of bikes and riders. Tony’s Track Days regularly sees sport tourers and adventure bikes at their days. But, to encourage cruiser riders and tourers to attend, Tony is offering a “non-sport bike” track day for 2014. Now, even cruiser-types can ride around a curvy ribbon of pavement without the risk of hitting a car or sliding on sand, or getting a speeding ticket. Another fun training opportunity is on-street training tours. Stayin’ Safe has been providing training tours and I am offering tours as well. This combines scenic rides with experienced people who can offer tips for learning how to be safer and in more control. The snow is finally melting and now is the time to plan your season. Do yourself and your loved ones a favor and get your skills sharpened. You won’t regret it. Share your thoughts below on your most valuable training experience. Ken, I absolutely agree with you. When I got back into riding after being away for 30 years I made a promise to myself to learn how to ride to mitigate the risks. When I’m highly skilled I know I’m riding safer. I like to twist the throttle on occasion but stay within my abilities – which have increased with training and experience. I found with greater skill and confidence came greater enjoyment too. In the last 13 years I have taken the BRC, the ERC 3 times, the Advance Riding Clinic by Lee Parks and am signed up for the Stayin’ Safe course in May this year. One thing that my 67 years has taught me is the most important safety tool I have is the one between my ears. Bob, Good for you. Are you doing the Stayin’ Safe in CT? If so, then I’ll see you on that Saturday. Ken, you MUST get that simulator and bring it to the track!! Regarding the concept that familiarity breeds contempt, I do see that frequently with riders I meet outside the track setting. I find myself going in the opposite direction, the more I learn, the more I realize I don’t yet know. Here’s to lifelong learning (and an end to this arctic weather)! Ken,a good friend of mine provided much needed guidance when I started riding again after 30 years away. He turned me onto Riding in the Zone. I read it again and again. I took the MSF course to start with. I practice regularly (been out on some cold days). I cannot wait to have more miles under my belt to take an on street training class. It sounds informative and fun. Best way to learn. Thanks, I would not known about this if it wasn’t for you. I am an active ridercoach with our Louisiana Motorcycle Safety, Awareness, and Operator Training Program, as well as the Harley Riders Edge, now Riding Academy program. I am always amused to see long-time riders decide to take the courses offered and at the end say how much they learned that they did not realize that they did not know. Everyone learns something during the course of a weekend class session. I cannot count how many comment, after the slow speed turning maneuvers, “so that is why I drop my bike occasionally!” They discover that using the front brake with the bars turned at low speed will usually cause a drop doing parking lot turns. The other thing that we universally hear is that they have a lot of fun learning stuff. Big grins are always present during class ! Do yourself a favor and take a motorcycle skill class. Any class. You absolutely will have fun and learn stuff that will make you a much better rider. It might even save a bad crash or even your life. Thanks Ken, for a great website ! Thanks Doug. I am amazed myself at the “Ah Ha” moments and how few riders don’t realize that they don’t know what they need to know.